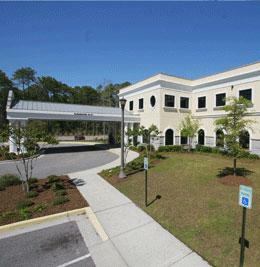 Grand Strand Regional Medical Center is an acute-care hospital providing high-quality health care to the Myrtle Beach community since 1978. With over 250 board-certified physicians, over 900 staff members, and over 200 volunteers, the 219-bed hospital prides itself on its commitment to the care and improvement of human life. Grand Strand Regional Medical Center is accredited by the Joint Commission on Accreditation of Healthcare Organizations. Its cancer program is accredited by the American College of Surgeons, and its diabetes management program is recognized by the American Diabetes Association. Grand Strand Regional Medical Center is a designated community trauma center and has the only cardiac surgery program in the area. The hospital treated over 66,000 emergency patients and performed approximately 400 heart surgeries in 2008 alone. In addition to Emergency Services and Cardiac Care, the hospital provides numerous other services, including Critical Care, Oncology, Radiology, Maternity, Diabetes Management, Physician Referral, Physical Therapy, Auxiliary, Community Health Programs, H2U Program (a nationwide program that provides social and health benefits and opportunities to senior adults), and Mercy Hospice and Palliative Care. Grand Strand Regional Medical Center also has seven off-site departments throughout the Myrtle Beach area: Grand Strand Regional Diagnostic and Women�s Center, South Strand Ambulatory Care Center, North Strand Diagnostic Center, Carolina Forest Senior Health Center, North Strand Senior Health Center, South Strand Senior Health Center, and HealthFinders, which provides screenings, classes, physician referral, and general health information. Grand Strand Regional Medical Center�s many services and locations help provide comprehensive, convenient healthcare to the community.